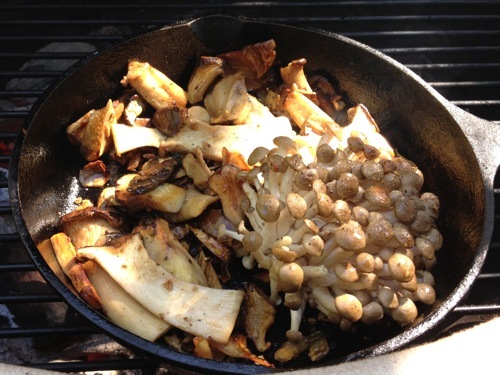 Grilling mushrooms is a great way to serve up fungi! The naturally meaty and earthy flavors of mushrooms pair beautifully with the smokey caramelization that grilling adds to them. Get ready for an umami feast when you fire up some mushrooms with your next grilled meal. Also, mushrooms make a great accompaniment to all kinds of grill foods, from beef to chicken and more. So be sure to try grilling mushrooms the next time you are planning a BBQ. There are a number of ways to grill mushrooms. One of the most important things to consider is their size and shape. Mushrooms range from very small to quite large. Obviously, they can also be quite small if they are cut up. The size and shape of the mushroom pieces can affect the way you grill them. For example, while large, whole mushrooms such as large portabella and shitake mushrooms can be grilled directly on the grill, smaller mushrooms or cut up pieces will fall through the grate of most grills. For whole mushrooms or larger pieces: Very large mushrooms can be cooked directly on the grill, maximizing their searing and caramelized flavors. This can be done with any large mushroom that can fit on the grill without falling through the grate (whole portabella, shitake, king oyster, etc.). One important thing to consider when grilling mushrooms in this way is how to flavor them. Obviously other small flavoring agents such as chopped up garlic, chopped herbs and the like can't be thrown on with the mushrooms like you would do in a saute pan. So this style of cooking grilled mushrooms is best for when you want simply flavored mushrooms whose flavors speak for themselves. One option is to marinate the mushrooms before hand with some ingredients but I urge you not to use too much liquid. Mushrooms act like a sponge and will soak up the liquid. While a lot of this will drip or steam out of the mushrooms as they cook, they can dramatically change the texture of the mushrooms and if the flavors of the ingredients are strong they can overpower the mushrooms. Experiment with this to determine how much liquid marinade you like. For most good mushrooms they do not need a huge amount of flavoring to make them taste good, their own meaty flavor is enough, it just needs to be woken up a bit. Try simply drizzling the mushrooms in extra virgin olive oil and seasoning generously with salt and pepper. Then simply grill directly over direct heat until they are done to your liking, flipping them part way through the cooking process. Then just serve them up! Grilling mushrooms can be just that easy! 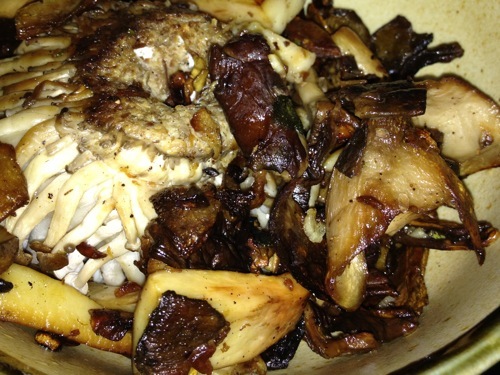 Smaller or Cut-Up Grilled MushroomsIf instead you wish to grill mushrooms that are smaller or cut-up, or flavored with liquids or other small flavoring agents (soy sauce, chopped garlic, herbs, etc.) you'll need a slightly different cooking technique. By far my favorite other technique for cooking mushrooms on the grill is sauteing in a cast iron pan. You will need a cast iron or other entirely metal saute pan. Note that if you use a steel or aluminum pan on your grill it may become stained by smoke. This won't affect the use of your pan. However, I prefer to use a cast iron pan which is already black and therefore you don't have to worry about it. The cast iron is also very good at withholding heat so that the food cooks quickly and evenly. See my grill skillet cooking page for more info about cooking on a grill with a saute pan or skillet. In this technique you are basically just using a pan like you would on your stovetop. 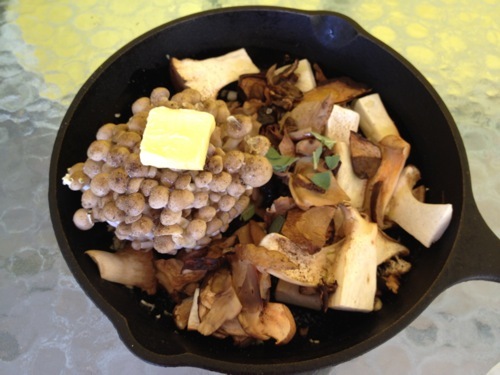 It is heated on the grill over direct heat and then the mushrooms can be sauteed in the pan. In the example shown here, I assembled a very simple recipe. I selected a handful of different fresh mushrooms at the market and coarsely chopped them (the specific mushrooms you choose are up to you, but I like an assortment of at least a few different types to add some complexity as well as to make the dish more interesting to look at! These were then sauteed with olive oil and a couple pats of butter with only sea salt, freshly cracked black pepper, a couple cloves of chopped garlic and a few torn-up sage leaves. I simply sauteed them over high heat for several minutes until the mushrooms started to wilt and brown and the chopped garlic starts to brown. Try to avoid heat that is too high which could burn the garlic quickly. If you keep stirring often as the mushrooms cook, this shouldn't be a problem. These are my favorite ways to grill mushrooms. However, there are a couple other options. Smaller chopped mushrooms can also be grilled in a vegetable basket or wrapped in foil, similar to my foil-wrapped grilled vegetable recipe. While this is a perfectly fine way to grill mushrooms, they tend to have more of a liquidy, stewed texture to them and don't develop the dark caramelization that grill mushrooms directly on the grill or in a hot skillet get. Done with the Grilling Mushrooms page?